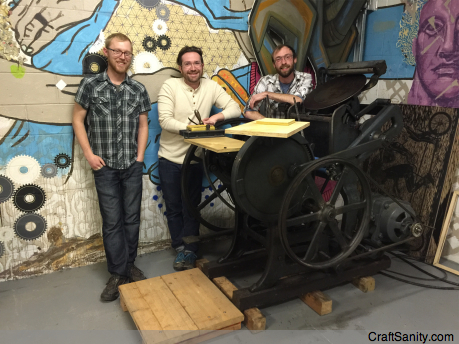 From left, Anthony Mead, Steven Rainey and Kyle Isbell co-owners of Dinderbeck, a Grand Rapids community printshop, pose by the Chandler & Price press they use to complete custom print jobs. Open studio sessions are held from 6-10 p.m. Monday, Tuesday and Thursday, and on weekends by appointment at 323 Straight St. SW in Grand Rapids. Visit dinderbeck.com for upcoming workshop information. It just got a whole lot easier to be a printmaker in West Michigan thanks to three Grand Rapids artists. Anthony Mead, 27, Kyle Isbell, 26, and Steven Rainey, 30, have realized their long-term goal to transform the Dinderbeck collective space into a community printshop at 323 Straight St. SW in Grand Rapids – a project that has been four years in the making. While public print studios have existed in bigger cities, West Michigan didn’t offer many viable options to those looking to print on a budget. So, Mead, Isbell and Rainey decided to do something about that. Dinderbeck was originally founded in 2010 by a group of Kendall College of Art & Design students who wanted to share presses and studio space. The founding group swelled from a handful of members to a collective of more than a dozen. Mead and Isbell were part of the founding group and Rainey joined a short time later. They worked as a team to rescue old presses as their plan to acquire equipment started to take shape. From day one, there was talk of creating a public printshop. 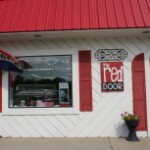 “We really wanted to engage with the community,” Mead said. Read the rest of my column about Dinderbeck on MLive.com or in the Home section of today’s edition of The Grand Rapids Press. Listen to episode 147 of the podcast to find out how this trio of artists realized their goal to open a public printshop and check out the Dinderbeck site to find out more about classes, workshops and other creative opportunities. P.S. You can read about my previous collaboration with Rainey here. It was a very authentic-looking gunslinger apron. 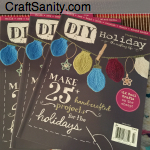 Enter to Win: I got my hands on a few copies of the premiere issue of DIY Holiday, a new Interweave publication. 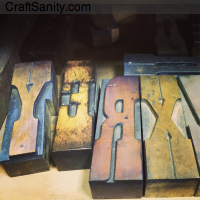 And I have to say it’s almost as good as CraftSanity Magazine. I’m kidding! It’s doesn’t even compare. Okay, I better stop with the jokes before I alienate you all. I’ve been trapped inside my house working all weekend and I’m feeling a bit punchy. Please forgive me. Ahem. Tell Me Your Handmade Story! I’m always looking for show ideas and interesting people to interview. Email me your podcast and magazine story ideas and make my day. I love hearing from creative people around the globe. mittens romneycare CANNOT win against comrade downgrade.He is NOT the most electable. He has been running for office for how many years? And he won one time. Yeah, he's a shoo in./sAnd frankly, no one likes him. He' a phony, plastic, privileged dork. I had gotten away from reading this blog everyday while trying to build my business but for some reason the other day I opened the email and WOW, I am so glad I did. 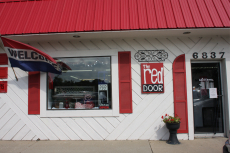 This blog CAN help my business grow and I”m so glad because this is actually a fun tme!